Enjoy full wireless freedom with our range of Bluetooth headsets. 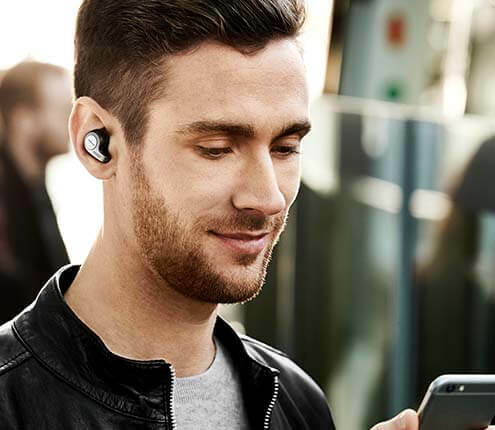 Whether you opt for a single earbud, wireless over-ear headphones or sports earbuds, you can enjoy the many benefits of Bluetooth connectivity. From fuss-free usability thanks to their wireless design, to wind noise protection and top-quality sound, Bluetooth headsets make talking and listening to music on the go easy. Our Bluetooth earphones are built to last and designed for all-day wear, making them ideal for frequent users both in and out of a working environment. 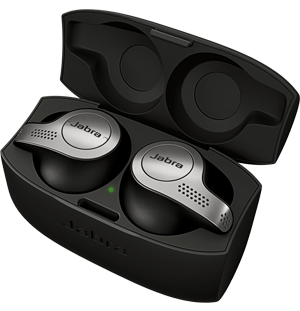 Choose from Jabra’s various styles. Tips & Tricks conneting your Bluetooth headset to a phone, tablet or other compatible device. From call centers to fitness centers, wireless headphones are used by millions of people every day for work and play. For example, wireless headphones are popular with gamers, since it frees you to move around without having to worry about a cord. People doing a workout at the gym or in front of their TV in the living room love the freedom of wireless headphones. They are also perfect for people who want to watch late-night television without disturbing others. Wireless headphones work by connecting, or pairing, with the device you want to use, through a radio or infrared signal. Many devices use Bluetooth technology to make connecting easier for the user. Devices with Bluetooth technology can connect and exchange data over very short distances using radio transmissions. Headphones with Bluetooth also let you connect to multiple devices simultaneously. A product with Bluetooth technology has a tiny computer chip inside that contains the Bluetooth radio, and software that makes connectivity between devices possible. So when Bluetooth-enabled products, such as a cell phone and headphones, are in close proximity to each other, they connect, or pair. This enables you to talk on the phone or listen to music without wires. Connecting a wireless headphone differs depending on the device you are using, but it’s easy once you know how. Here is a list of the most popular devices that people use with wireless headphones and how to connect them. First, make sure that your base is plugged in and the headphone batteries are fully charged. Ensure that the headphones and television are in close proximity to one another. Turn the headset on. Go into setting on your TV and turn on Bluetooth. Find the headphones under Bluetooth devices in your TV and you should be able to hear the television. The Xbox 360 supports two different types of wireless headphones, ones that have Bluetooth capability and ones that do not. The first method below explains wireless headphones without Bluetooth capability and the second with Bluetooth. Make sure that your headphones are charged, which can be done by plugging them into the USB port of the console. Turn on the console and the headphones. After they are powered up, push and release the connect button on your console. Within 20 seconds, press the connect button on your wireless headphones for two seconds. You should now hear sound from your headphones. Plug your wireless headset into the console to install the latest headphone drivers. You will need to be connected to Xbox Live in order to do this step. Make sure that your headset is charged, which can be done by simply plugging it into the unit. If you charge your headset through the console, it will connect automatically most of the time. If they don't connect automatically, turn on your console first and switch the headset so that it is Bluetooth mode. Press the power button for two seconds until it flashes green. You should then hear a start-up sound, and when you hear that, press the connect button for two seconds. After you release that button, press and release the connect button on the console within 20 seconds or the connection will not be made. The green lights will flash three times to let you know the connection was a success. Go to the XMB home menu and select the "Settings" icon. From there, select the "Accessory Settings" icon, and from that menu, find the option that says "Manage Bluetooth Devices." If there is no current Bluetooth device registered on the PS4, there will be an option that says "The Bluetooth device has not been registered. Do you want to register?" You will need to highlight the "Yes" option and click the "X" button on your controller. If the pairing was successful, the device will show up on the screen. Next, you will see a screen that says "To register (pair), you will need to prepare the Bluetooth device. For information on preparing the device, refer to the instructions supplied with the Bluetooth device." Click on "Start Scanning" on the screen with your "X" button so that the PS4 can start to scan. Also, you need to make sure your headphones are in pair mode so that the PS4 will recognize the device. If the pairing was successful, it will show you on the screen and you just need to hit the "X" button to continue. You will then be asked to enter the pass code or security key that was provided with your wireless device. Use the keyboard that is provided on the screen to enter the pass code. Once everything is entered properly, a message tells you that the device has been registered. Next, go back to the "Accessory Settings" menu to access the "Audio Device Settings" menu. Select the "Input Device" option by clicking "X" on the controller. When the new menu opens, look for the proper microphone input that corresponds with your device. Once you find the right one, click the "X" button. Select the "Output Device" option to select the headphones. Once you search through the options that the system recognizes, click "X" on your wireless headphones to select them. You should now be set up and ready to use the wireless headphones and microphone. Find the "Settings" icon on your iPhone, which is normally on the home screen. Open and click on the "General" button. Then, hit the "Bluetooth" button and slide it over to turn the function on. Your iPhone should find the device once this is enabled and should show the device name on screen. When it does that, you will need to hit the "Pair" button in order for the devices to sync. You may need to enter a four digit password, which is provided with your wireless device. Once that is entered, hit "Connect" on your iPhone to complete the setup. Your headphones should now be working properly. Make sure that your wireless headphones have Bluetooth capability. Access the "Settings" icon on the home screen of your iPod. Select the "General" option once you are in that screen. You will then see an option that says "Bluetooth", which you can slide over to enable Bluetooth on the iPod. Be sure that your wireless device is in discovery mode so that the iPod can recognize it. Once you enable the Bluetooth on the iPod, it will list any devices that is recognizes. Simply click on your wireless device when the iPod shows it and click the "Connect" button. Your headphones should now be paired and working properly. 4 Jabra Elite Sport is waterproof and comes with a 3-year warranty against sweat damage (registration required).